ASUS today has announced the first shipments of the ASUS Eee Pad Transformer, the best tablet choice for users looking for both media consumption and mobile productivity. Featuring an expandable keyboard docking station and combined battery life of up to 16 hours*, the Transformer is running the new Android 3.0 operating system, Honeycomb. Combining Honeycomb with ASUS’ intuitive Waveshare user interface and the most powerful hardware features available makes the Transformer an exciting portable device supporting both office work and social communication. Powered by the NVIDIA® Tegra™ 2 dual-core processor, the Transformer browses the web at blazing speeds, providing a snappier response time and better performance when multi-tasking. An IPS Panel made from durable and scratch-resistant glass is viewable at angles up to 178°, and produces a crisper and more accurate color range by up to 50% when compared to other tablets in the market. Built-in SRS Sound technology provides a dynamic 3D stereo audio experience, with maximum bass response and a wide sound field from the discrete speakers housed in the 12.98mm thick frame that weighs only 680g. A 5MP rear- and 1.2MP front-facing cameras can shoot and record video, which can be played back in video on HDTVs via a mini HDMI output port, making it a true mobile entertainment device. The Transformer sets itself apart from other tablets on the market by featuring an optional docking station. 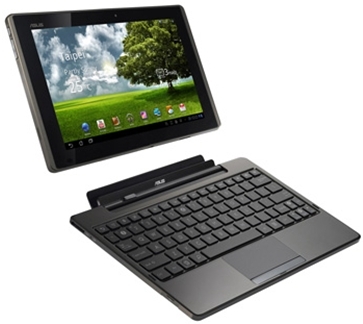 This provides access to a full QWERTY keyboard along with unique Android Function keys, turning the tablet Transformer into a full-fledged notebook. Preloaded on the Transformer is Polaris® Office® 3.0, a professional Mobile Office Solution which enables users to edit various types of office documents including documents (.doc), spreadsheets (.xls) and presentation (.ppt) files, making the Transformer very attractive for professional use. A touchpad, 3.5mm audio jack, two USB ports as well as a built-in SD Card reader for easy file sharing and storage expandability makes the Transformer a versatile media hub. In addition, the ultra-convenient ASUS WebStorage with one year of unlimited storage space provides worry-free cloud computing. The docking station also extends the Transformer’s 9.5 hours* of battery life up to 16 hours*, so users can use it all day for work and play. Google’s Android Honeycomb is a revolutionary operating system specially designed and optimized for tablets, and enables users a full web experience for on-the-go web browsing, communicating and casual computing. Supporting Adobe® Flash® 10.2** and the ever growing Android Market, entertainment is a finger swipe away. The convenient ASUS Launcher also allows users to easily launch software, manage content and access online services and connect devices with a few simple taps, while ASUS’ Waveshare Interface hosts a variety of unique applications such as MyNet, MyLibrary, MyCloud and more. MyNet easily streams digital media wirelessly within home network devices so HD videos or music can be played on devices such as an HDTV or desktop PCs for an even better experience from the Transformer. MyLibrary consolidates downloaded books, magazines and newspapers in to one easy to browse profile while MyCloud is a total cloud solution, providing access to digital content such as music, videos and files from the cloud anywhere, anytime. Users can even use MyCloud to remotely access and control any PC or Mac system and access applications or files to extend the versatility of the Eee Pad Transformer experience. *9.5 and 16 hour battery life estimated under certain conditions. **Adobe® Flash® 10.2 support requires an upgrade available online.